Up to this point in Level One, we've discussed both Limited and Constructed, but have not yet delved into the differences between the various Constructed formats. The fact is that the game-play of different constructed formats can feel worlds apart, and each requires a different approach to be successful. Before getting into the particulars of formats and cards, let's touch on what exactly makes Constructed formats different from one another. Speed: On what turn can the fastest decks typically win the game? How much, and what type of early defense will you need to survive? How often do games drag on into the very late stages? Power Level: Where is the bar for what you ought to be doing at each point in the game? How powerful are the creatures and spells of varying mana costs? Balance: Do any decks, strategies, or cards stand out from the rest? If the answer is yes, what does it take to compete against the top dogs? Diversity: Can you predict what you're likely to face when you enter a tournament? How many competitive decks are there? How much variation should you expect within each archetype? Complexity: How challenging is the game play? This can affect your deck choice and other aspects of your tournament preparation. The Size of the Format: How many cards and sets are legal for play? With very few exceptions, the larger the format, the more powerful and the faster it will be. It will usually also be more diverse and more challenging simply by virtue of allowing for more possibilities. With an eye on these variables, let's discuss the most commonly played tournament Constructed formats. Standard is by far the most played Constructed format. It's also the easiest starting point for a new player. As such, the vast majority of the examples that I choose for Level One come from Standard. Standard is a rotating format, which means that it changes relatively often. For a technical and detailed explanation of the formats, refer to the various format pages. Put simply, cards released in the last two years are usually legal in Standard. This is a relatively small card pool, which means that Standard has a relatively modest power level and is not terribly fast (it takes extreme circumstances for a game to end before turn 5). With a smaller card pool, balance and diversity are not necessarily guaranteed. There are sometimes a small handful of cards that stand out in terms of power level, and it's often in your best interest to build your deck with these cards in mind. The best cards are not always replaceable, and some decks will function much differently depending on the presence or absence of their key cards. For example, consider a Green Devotion deck that performs much better when it starts the game with Elvish Mystic, or a Sultai deck that really needs Satyr Wayfinder to fuel its graveyard. These are some general concepts to be aware of in small formats. However, another hallmark of Standard is how often it changes, so it's important to stay open-minded and be ready to adapt. 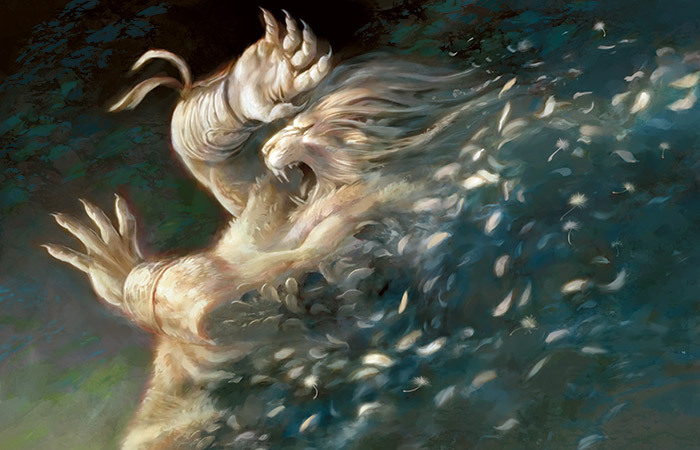 Today's Standard is fairly balanced and fairly diverse, with strategies ranging from hyper-aggressive Mono-Red, to various builds of Abzan Midrange, to Blue-Black and Esper Control. Below is an example of a Standard deck. It's a fast red-based aggressive deck that focuses on deploying a lot of creatures very quickly, and then unloading damage via Atarka's Command and Stoke the Flames. The only commonly-played Constructed format with a smaller card pool than Standard is Block Constructed. The chance of certain cards standing out in power level and being difficult to replace becomes even more likely. For example, in Theros Block Constructed, Sylvan Caryatid; Courser of Kruphix; and Elspeth, Sun's Champion were staggeringly powerful. You would've wanted a very special reason to do anything other than play with these cards, or play a strategy that was effective at beating these cards. Modern is a non-rotating format. Sets that are newly released become legal in Modern, but they do not push older sets out. Sets from Mirrodin and Eighth Edition (released in 2003) to the present are legal, and will always be legal in Modern. However, Modern also features a banned list, which is a collection of specially chosen cards that, despite being from Modern legal sets, are not legal to play with. These cards are usually chosen because they're too powerful, but a card can be banned for other reasons as well. Historically, the Modern banned list has been adjusted about once per year, and has caused some of the most impactful changes to the format. Despite the banned list, Modern has a card pool many times the size of Standard's. As you might expect, decks in Modern are much more powerful and can be much faster. There are many, many strategies that can win on turn four against an unprepared opponent. Another hallmark of Modern is its diversity. Modern enthusiasts could probably produce a list of 50 or more competitive decks, with plenty of variation possible within each one! (Although they aren't necessarily all equally strong). In a format as fast, powerful, and unpredictable as Modern, it becomes valuable to focus on a proactive strategy. A reactive strategy would struggle because there are too many decks attacking from too many different angles, you can't be prepared to shut them all down at the same time. Instead, it's better to focus on enacting a powerful game plan of your own and know that if you can succeed in doing so, you can win in spite of most things your opponent might throw at you. Below is an example of a Modern deck. It's a blue-red deck with some reactive cards that give it the ability to loosely control, or at least slow down, the game. Importantly, though, it packs a big punch with the game-winning combo of Deceiver Exarch and Splinter Twin. If the opponent leaves an opening, this deck can cast Deceiver Exarch at the end of the turn, untap, and then enchant it with Splinter Twin. Deceiver Exarch then taps to make a copy of itself, which untaps the original Exarch and repeats the process. In this way, this deck is capable of making an unlimited number of tokens with haste, and killing an opponent from any life total at a moment's notice! Legacy is an Eternal format, which means that all sets from the entire history of Magic are legal. Like Modern, Legacy features a somewhat extensive banned list of cards deemed too powerful to be allowed. A staggeringly large card pool defines Legacy. There are thousands of extremely powerful cards that can be combined in countless ways. For any effect you might be looking for, there are likely to be a huge number of options at your disposal. Consider that in Standard, if you wanted a spell that cost one mana and dealt damage directly to your opponent, you wouldn't have many options beyond Wild Slash, Spark Jolt, and Collateral Damage. In Legacy, just to name a few, you'd have: Burst Lightning, Chain Lightning, Firebolt, Galvanic Blast, Lava Dart, Lava Spike, Lightning Bolt, Pillar of Flame, Rift Bolt, Seal of Fire, Shard Volley, Shock, Tarfire, and Assault // Battery in addition to everything legal in Standard! When I play Legacy, even as a Magic player of 20 years, I still encounter cards that I've never seen before! The enormous card pool makes Legacy fast and powerful. The incalculable number of situations you might face make it unpredictable, diverse, and challenging. 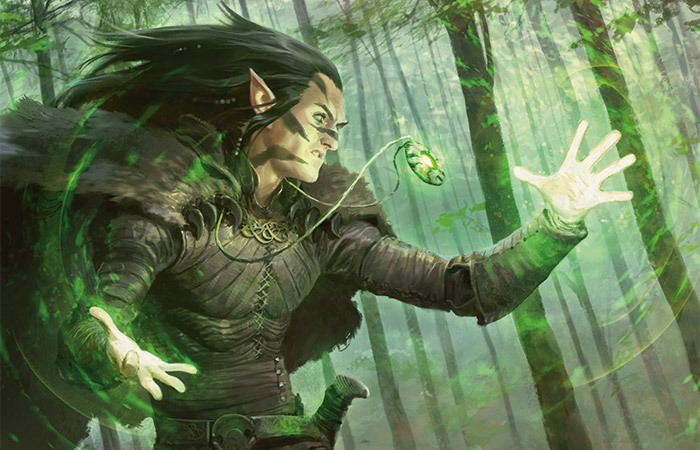 Legacy has two defining cards that deserve special mention in any overview of the format. Much of what's possible in Legacy is also possible in Modern, but one main difference between the two formats is the excellent library manipulation available in Legacy. Cards like Brainstorm, Ponder, and Preordain serve to: (A) increase the consistency of blue decks (this is particularly important for combination decks), and (B) to multiply your in-game options exponentially. When you play with Brainstorms, you see a larger portion of your deck than you otherwise would in each game. You also have more flexibility and control over your draws. The other defining card in Legacy is Force of Will. It might even be worthwhile to expand our scope and talk about all "free" spells. Where the presence of library manipulation multiplies your own in-game options, the presence of free spells multiplies the number of actions that your opponent might take against you at any given time. The combination of these two factors make Legacy's game play much more complicated and challenging than smaller formats. Additionally, free spells—and free counterspells especially—increase the efficiency and speed (they increase the speed in some ways but not others) of the format. They make it difficult to play with expensive spells, and force Legacy decks to be sleek, simple, and low-to-the-ground. Below is an example of a Legacy deck. It's a white-blue dedicated control deck that plays with a lot of library manipulation (Brainstorm, Ponder, and Sensei's Divining Top) in order to utilize Counterbalance and cards with the miracle ability. Vintage is not played at the Grand Prix or Pro Tour level, in part because the best decks card cards that are difficult to obtain for many players. Like Legacy, Vintage is an Eternal format. However, where Legacy has an extensive banned list, in Vintage, no cards are banned for power level reasons. (Some cards are banned for other reasons, and some cards are restricted to a maximum of one copy). Vintage is as close to "anything goes" as you can find. The decks are outrageously powerful, with wins on the second—or even the first turn—being quite possible! What Vintage has that Legacy does not is fast artifact mana (like Black Lotus, Mox Sapphire, and many others), and extremely powerful card drawing (like Ancestral Recall and Wheel of Fortune). Like Legacy, Vintage is very challenging. It can be difficult to dive straight into the Eternal formats, so I recommend trying Modern first in order to bridge the gap between Standard and Legacy or Vintage. However, once they get there, many players fall in love with Legacy and Vintage because they're such deep, interesting, and rewarding formats to play. All Magic formats are a ton of fun, and worthwhile to try out at least a couple of times. In fact, the best way to become a complete player is to cross-train in as many different formats as possible. Playing Modern or Legacy might teach you lessons that you can use to improve your game in Standard or Block Constructed. Variety is the spice of life. Part of what makes Magic such a great game is the limitless possibilities available to its players. Try some of them!